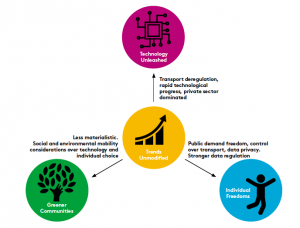 The UK ‘Future of mobility’ report looks out to 2040. It looks at the whole transport system – considering the users and goods. It considers new opportunities and the implications of current trends. It builds four plausible future scenario’s to help decision makers think about the future. 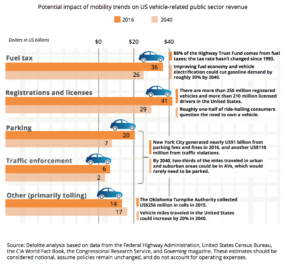 Most governments rely heavily on revenue generated directly and indirectly by transportation. Everything from fuel taxes to parking fees, traffic violation fines, value-added taxes from vehicle purchases, subway and bus fares, and registration and licensing charges can provide critical revenue to maintain infrastructure, support public transit, and more.